Returning to their home kingdom of Lancre after various misadventures elsewhere, Granny Weatherwax and Nanny Ogg are disconcerted to discover a new, younger and more hip coven of young witches has arisen in their absence. Whilst they deal with the situation with their traditional patience and thorough levels of understanding, Magrat finds that arrangements for her marriage to King Verence are steaming ahead and the invitations have been sent out already. One recipient is Mustrum Ridcully, Archchancellor of Unseen University in Ankh-Morpork who decides to attend on a whim (and the prospect of excellent fishing), dragging the terminally confused Bursar, the simian Librarian and the very keen young Ponder Stibbons (whose favourite word is 'quantum') along for the ride. 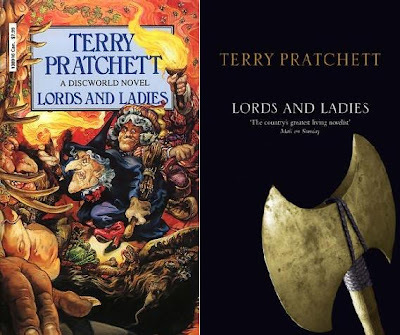 Lords and Ladies is the fourteenth Discworld novel and the third featuring the Lancre witches' coven (and the fourth to feature Granny Weatherwax). Despite the novel working perfectly well as a stand-alone, Pratchett was sufficiently concerned about the book's continuity ties that he provides a thorough synopsis of Wyrd Sisters and a somewhat briefer one of Witches Abroad before cracking on with the tale, which is a nice touch but unnecessary. One interesting device Pratchett starts employing in these middle-era Discworld books is taking a concept or idea mentioned very briefly earlier in the series and fleshing it out into a full-sized novel. For example, a running-gag in Reaper Man about a con artist and his trained mice eventually turned into The Amazing Maurice and His Educated Rodents whilst the Hogfather was mentioned a few times before finally getting his own book. Similarly, Lords and Ladies builds on a very brief mention in The Light Fantastic where Twoflower starts dreamily talking about beautiful elves and Rincewind reacts the same way you would to someone saying, "Well, Hitler wasn't a completely bad person..." And of course, fans had been asking for a while where the Disc's elves were, since the dwarfs and trolls had been very much in evidence. With this book Pratchett delivered the answer. It turns out that the Discworld's elves are a bunch of merciless and easily-amused homicidal maniacs with a perchance for toying with their prey before killing them. This leads to some of Pratchett's most effective horror and tension-filled sequences, not something he is renowned for but given how good he is at them it may be a style of writing he should have tried employing more often. Magrat's running battle with a bunch of elves in Lancre Castle stands out as one of the series' best action sequences, though still laced with some brilliant moments of humour (such as the introduction of the Schroedinger's Greebo paradox). Granny Weatherwax, one of Pratchett's most complex and interesting characters, gets some very fine character development in this novel as we see some more of her past and also get a glimpse of the other lives she could have lived if things had turned out differently. Ridcully, hitherto one of Pratchett's more straightforward creations, also gets some much-needed depth to his character as well. The Bursar provides some amusing comic relief, but is thankfully not over-used. Some later books, most notably Interesting Times, are actually bogged down by his mindless babbling, but here it is more restrained. The return of Casanunda the permanently horny dwarf is also welcome and gives rise to several sequences which are among the funniest in the whole series (his lowwayman hold-up of Ridcully's coach is a classic scene). 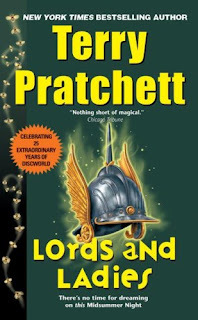 After Small Gods, the best book in the series, Pratchett could have been forgiven for resting on his laurels and maybe bashing out a quickie Rincewind travelogue comedy or something. Instead, he cracked on and produced a book that is a strong candidate for the most relentlessly funny and entertaining book in the series, with a twisted dark side (possibly influenced by his then-recent collaboration with Neil Gaiman, Good Omens) and some great character development thrown in for good measure. Lords and Ladies (*****) is available now in the UK and USA. Can Pratchett make it a five-star hat-trick with Men at Arms? We'll see soon (although I have a couple of other books to get through first).